DALLAS, T.X. — Harrison Barnes stayed on the bench in the fourth quarter after news broke that the Dallas Mavericks forward had been traded to Sacramento. The seventh-year player lingered on the floor a few extra moments after the game to chat up some Charlotte opponents, then walked through a throng of fans who seemed to want to say goodbye after seeing all the social media activity on their phones during the second half. The makeover of the Mavericks continued even as parts of the blockbuster trade that brought Kristaps Porzingis from the New York Knicks were making their Dallas debuts. Porzingis isn’t playing this season as he recovers from a knee injury. 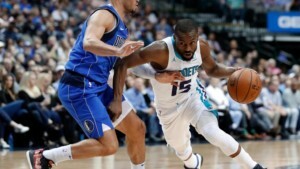 Rookie sensation Luka Doncic scored 19 points in his third triple-double, Dorian Finney-Smith had 15 points and 10 rebounds and the Mavericks made another move by dealing Barnes while beating the Hornets 99-93 on Wednesday night. Tim Hardaway Jr. scored 12 points in his first game since leaving the Knicks. Trey Burke went scoreless in four minutes while Courtney Lee didn’t play. Barnes, who was traded for Kings forwards Zach Randolph and Justin Jackson, played most of the third quarter before reports of the deal surfaced, scoring seven of his 10 points. He wasn’t available in the locker room after the game. Dirk Nowitzki started realizing something was up when Barnes didn’t replace him early in the fourth quarter as usual with the 40-year-old playing a limited role in his record 21st season with the same franchise. Since Nowitzki credited Barnes for being a positive influence in his two-plus seasons with the Mavericks, he wasn’t surprised that Barnes stuck around after word of the trade got out. Kemba Walker had 30 points and a season-high 11 rebounds for the Hornets, who got swept by Dallas after losing to the Mavericks by 38 points at home about a month ago. With NBA Commissioner Adam Silver watching from not far behind the Mavericks bench, Doncic had a spinning layup for a 3-point play with Dallas leading by two and answered a bucket by Batum with a 3 to push the lead to six. The first teenager with multiple triple-doubles, Doncic had 11 assists and 10 rebounds on a rough shooting night (5 of 20, including 2 of 10 from 3-point range). Batum, who finished with 14 points, got the Hornets within three with a 3-pointer before Finney-Smith answered from long range for a 97-91 lead in his second career double-double. Hornets: G Tony Parker was out with a back strain in what would have been his first appearance in Dallas since leaving San Antonio after 17 seasons with the rival Spurs. … Jeremy Lamb scored 15 points, and Cody Zeller had 13 rebounds with nine points. … Batum was just 2 of 9 from 3-point range as the Hornets shot 24 percent from beyond the arc. Mavericks: After setting franchise record for 3s in a quarter by going 10 of 17 from long range in the first quarter of the meeting in Charlotte, the Mavericks missed their first 10 before Hardaway and Doncic hit consecutive 3s in the final 1:11 of the first. … All of Doncic’s triple-doubles have come in the past seven games. … Dwight Powell had his second double-double with 11 points and 12 rebounds. … As part of the Sacramento trade, Dallas waived C Salah Mejri. After trying to figure out how to incorporate three new guards into his rotation, and only using two, Mavericks coach Rick Carlisle has a couple of forwards coming in with Randolph and Jackson. Hornets: Second stop on a four-game trip at Atlanta on Saturday. Mavericks: Second of three straight at home against Milwaukee on Friday.